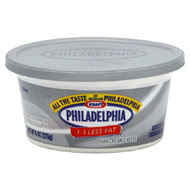 If I buy the 1/3 less fat Philly Cream Cheese, can I use 1/3 more cream cheese on my bagel? Of course you can...makes perfect sense. More on your tongue, more on your bum!